You be the judge, and it’s not hard on this one. Dean Bach owned and operated “Dino’s Lounge” in Ferndale, Michigan. A bar in Northville, Michigan was on the blocks and Bach and a guy named Martinez bid against each other for it. Martinez’s bid was accepted, but he didn’t have experience running a bar. The liquor license was about to go into escrow, so the bar needed to re-open fast. Martinez, his wife, and a guy named Konol (one of the sellers) met with Bach to see if they could get the bar opened quickly to save the license – Martinez would contribute money and Bach the experience. Bach provided recipes, menus, and his personal assistant to get the bar opened within a few weeks, in time for a local festival. The assistant arranged for the vendors for alcohol, coffee, food, cleaning, and linens. Bach, or his assistant, probably were the ones to arrange for the staff that ran the bar that weekend (Martinez testified “I don’t know who made arrangements to have all these servers drop out of the sky for two days.”). The bar opened as “Dino’s Sports Lounge,” had a caricature of Bach on the menu, and used the Dino’s Lounge logo on the menu and awnings. Bach helped publicize the new bar and restaurant. Q. Do you know if there was ever any discussions in compensating either Mr. Bach or Dino’s Ferndale for any efforts put toward the opening and running of Dino’s Northville? A. To my knowledge, there were no conversations, and given the fact that I was donating my time to help, my husband was donating his time, to me, it was– there would have been no compensation expected to try to get a business up and running. Q. But you were an equity owner, correct? A. Yes, I was an equity owner. Q. And Mr. Bach was not an equity owner, correct? Q. As far as you know, it was never your intention for Mr. Bach or Dino Drop to be paid for any whatever efforts they made? Q. Do you know if Mr. Bach was ever to acquire any equity ownership in the bar or the liquor license? A. Absolutely not. He was not. Q. From the inception, he was never going to have an equity ownership? Uh, yeah, Bach was letting them use his name, image and trademark, and helping get the place up and running, all out of the goodness of his heart. 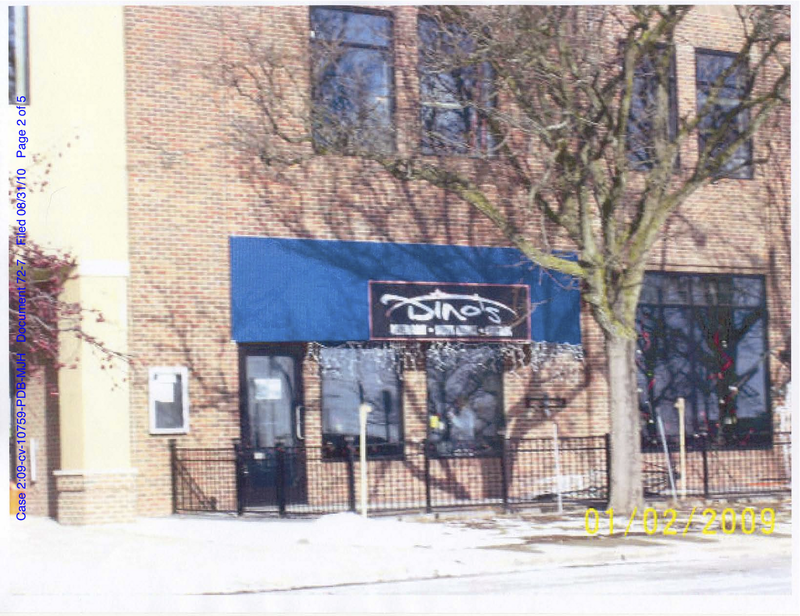 Not surprisingly, the relationship broke down and Bach’s business partner in Dino’s Ferndale (incidentally, a patent lawyer at Harness Dickey) sent a letter to the Martinezes’ lawyer instructing that they should “cease and desist from utilizing any and all indicia that would associate him with Dino’s.” The name of the Northville restaurant was subsequently changed from “Dino’s Sports Lounge” to “Dino’s Sports Grill” (yeah, that works) and ultimately to “Northville Sports Den.” It continued, though, to have “Dino’s” indicia at least on the awnings and continued to use a similar menu. The case is probably really mostly about what compensation Bach should have received for his contribution to the business. There’s a breach of contract claim that wasn’t decided on summary judgment, based on a writing on a bar napkin (yes, really). Bach is claiming 33% ownership in Dino’s Sports Lounge, 1/3 of gross revenues, and 3% of gross proceeds for the IP license. I’m sure you’ve figured out where the trademark infringement claim goes. “Dino’s” has secondary meaning (necessary to prove because it was an unregistered trademark in a personal name), in no small part because the court found that Dino’s Northville changed “Dino’s Sports Lounge” only as far as “Dino’s Sports Grill” in order to maintain the appearance of a connection with the original Dino’s. Likelihood of confusion then of course a slam dunk, as it should have been. A trade dress claim based on the menu was also a winner for Bach. Dino Drop, Inc. v. Chase Bar and Grill, LLC, No. 09-cv-10759 (E.D. Mich. Feb. 24, 2011).